The package bee prices for 2015. There will be quantity discounts available that will be published on our website soon. The first delivery will be 2 lb packages, the second delivery will be 3 lb packages. There will no longer be a cage deposit. All cages have been returned to California and we will no longer be taking back cages. We will start taking orders in late January. The year started normal with hives wintering through normal weather conditions. February brought us two subzero blasts. One around Feb 12th and the next in late in the month. The subzero temperatures caused many colonies in the upper midwest to die of starvation. In February the queen is laying and there is brood in the colony. Subzero cold for more than one day can cause the cluster of bees in the hive contract. Many times this takes the bees off available honey, The colony starves trying to keep the brood alive. The hives that survived were strong, well populated hives, weaker hives perished. The spring brought us cooler temperatures. Hives that survived the winter were slow to build up. April brought us the worst weather I can remember in 25 years of keeping bees. The weather was cold, rainy and very windy. This weather pattern was unrelenting for three weeks. It happened at the worst time when package bees were arriving. Many package bees installed on foundation didn't make it due to this cold. The bees could not generate the heat to get food, wax production, and start brood rearing. Most packages installed on drawn comb survived the cold and were chugging along feeding on pollen patties and syrup. The cold rainy weather persisted into May. The result was slow build up of package and overwintered colonies. As the weather got better all hives picked up speed and brood rearing kicked into high gear. Hive strength increased with package bees building up normally. Brood expansion had divides happening a little later than normal but the divides had good populations. The increased hive populations were ready for the nectar flow. The nectar flow came in later than normal. This turned out to be good news for most beekeepers by giving hives a longer time to build up. When the nectar flow started the early flow seemed the best flow of the season, later flows became spotty and widespread. The cold rainy spring weather hurt the nectar flow for most beekeepers in the upper Midwest. Basswood trees developed flower pods but all the flower pods fell off on most Basswood trees before they opened up. There was no Basswood nectar flow this year. The nectar flow in general was very spotty. Poor nectar flows can bring out higher swarming issues as the bees want to leave to possibly better food sources. Some beekeepers had good crops but most beekeepers experienced poor honey crops. With the poor honey crops beekeepers left their supers on later than normal. Mite treatments were delayed and were put on late for many of us. Some beekeepers lost colonies in October due to high Varroa levels. Hives that looked good in early October then a check in late October saw no bees and the hive full of honey. One word for this Varroa. The poor honey crops resulted in low hive weight for winter stores. Beekeepers that noticed this early were able to feed their colonies to get them to proper honey stores. Beekeepers that fed late found it challenging to get enough syrup into their colonies and the result were light colonies going into winter. Robbing was in high gear in the fall. Beekeepers feeding their hives finding robbers were stealing syrup and honey faster than they could put it in the hive. Some colonies moving backwards in hive weight due to robbing. Some colonies being overwhelmed and annihilated by marauding robbers. Strong colonies and entrance reducers kept this under control. Right now strong colonies with a good hive weight are doing fine. There are many colonies light on food and likely will not make the rigors of the winter unless the weather stays on the warm and mild side. This report while sounding negative is blunt and to the point, there are some bright spots in the report. Experiance is the road to success. By posting the negative, beekeepers can avoid the pitfalls if similar conditions happen again. Package bee survival can be greatly improved with one frame of drawn comb. Sugar Syrup can be sprayed into the cells with a hand sprayer. This food will make the package bee survival almost guaranteed. Always checking winter stores in mid August. If there is not enough winter stores then, supers need to be removed and feeding needs to begin. This gives time to get the proper amount of winter stores in the colony. 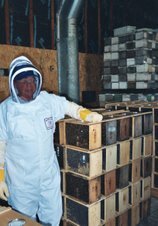 Beekeepers that wintered strong colonies with good hive weight and treated for Varroa are in great shape to successfully over winter their bees. This is a graph of internal hive temperatures. They are from two hives from Warner Nature Center from Marine Minnesota. Graph by Paul Liedel. This is a new updated graph. The outdoor temperatures can do a wide swing of daily temperatures. Where the hives internal temperatures are more steady. It is interesting to note that the internal temperatures are not that far from daily outside temperature highs for the day. 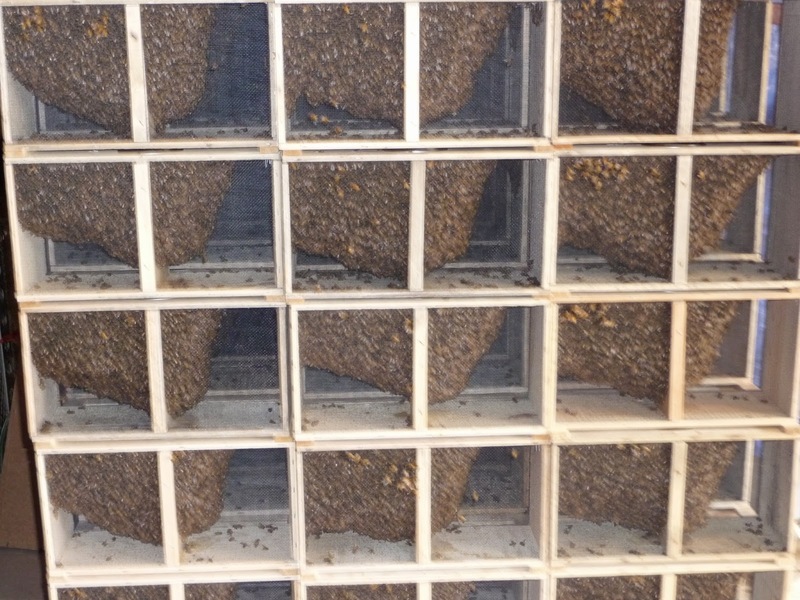 It is clear that opening a hive during the day at the high daily temperature does not impact internal hive temperatures. The temperature sensors are located in the hive at the moment away from the cluster of bees. As the cluster moves closer to the sensors the temperatures will rise on the graph. The temperature in the center of the cluster is in the 80's right now. When brood is present in February the core temperature around the brood will be in the 90's. We will be posting my package bee prices in late December. Start taking orders in late January. We will be getting the same number of bees as last year. Two truckloads. The first delivery will be all 2 lb packages. Second delivery will be all 3 lb packages. Your choice of a mated hygienic Italian or Carniolan queen. No cage deposit or cage exchange. If you have cages from 2014 and you want your deposit back you need to return them to us by December 20, 2014. After that date we will not refund cage deposits or accept cages. What is happening in a winter cluster of bees? Beekeepers winter colonies and most of us don't realize the biology of the bees that we are trying to get through the winter. These two links I think explain the what is happening in the cluster and what temperatures are really in the hive. Most beekeepers think if we open a colony in the winter the bees will perish in short order. The graphic clearly shows that the hive temperatures about 9 inches from the cluster, drop to near outside temperatures. The temperatures are in centigrade and there is a Fahrenheit conversion in the charts graphic. http://westmtnapiary.com/winter_cluster.html This site has a good explanation of honeybees. Check out the other articles on this website. This time of year I always make creamed honey for holiday gifts for friends and family. It is easy to make and it makes a special gift showing off your talent as a beekeeper. It takes about 10 - 14 days for the honey set up so if you want it by Christmas you need to make it by Dec 7th.